An enjoyable time appeared to be enjoyed by all with' No Fighting ' and stories of amazing ' chip in's ' and enormous long putts! The Winners were: Lorna McKinlay/Ruth Usher/Sue Nicholson with a score of 62! Thanks go to Thornton Golf Club for hosting our event for us, and also go to the bar and catering staff who tended to everyone's needs. The junior girls had a great day at Kirkcaldy GC on Sunday 10th September. Despite an 80% forecast for rain we only had two short sharp showers when the girls were at the 12th & 13th holes. All the girls played some fantastic golf which was admired by many of the members. Afterwards the prize giving took place with Mums, Dads and siblings all enjoying a tasty buffet. Emma Wilson presented the prizes and all the girls received a sleeve of balls. Thank you to Kirkcaldy GC staff and members for the generous hospitality and courtesy of the course, it is greatly appreciated. Many congratulations to all the girls. 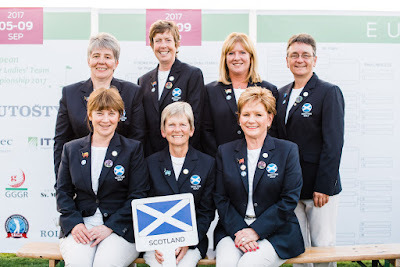 Congratulations​ ​to​ ​Lorna​ ​Bennett,​ ​Scottish​ ​Seniors Captain,​ ​and​ ​to​ ​Lorna​ ​McKinlay,​ ​team​ ​player,​ ​for​ ​their​ ​superb​ ​achievements​ ​at​ ​the​ ​Scottish Seniors​ ​Team​ ​Championships​ ​in​ ​Slovakia​ ​recently. Whilst​ ​they​ ​may​ ​have​ ​been​ ​disappointed​ ​not​ ​to​ ​qualify​ ​for​ ​the​ ​top​ ​flight,​ ​to​ ​have​ ​been​ ​the winners​ ​of​ ​flight​ ​2​ ​is​ ​praise​ ​indeed​ ​and​ ​Fife​ ​County​ ​are​ ​very​ ​proud​ ​of​ ​you​ ​both. Congratulations​ ​from​ ​Fife​ ​to​ ​all​ ​of the​ ​team. In recognition of their performances this year Evanna and Anna have been selected for the Scottish Schools International match against England at Troon Lochgreen on September 11th. Evanna the current Junior County Champion will defend her title at Kirkcaldy on the 10th before heading west to join the rest of the team. Three junior members Evanna, Anna and Eilidh were chosen to represent Scotland as part of the #Project19 initiative which saw six junior girls attend the 2017 Solheim Cup at Des Moines Golf & Country Club in Iowa USA. At the closing ceremony, on behalf of Scotland, Anna & Eilidh graciously accepted the invitation to host the Solheim Cup & Junior Solheim Cup at Gleneagles 2019. We wish the girls continued success in their quest to qualify for the junior event. More news recently brought to my attention is the crowning of Eilidh as the East of Scotland Girls Champion, Porscha as the Champion of Champions at Burntisland and also the winner of the Stephen Gallagher Trophy. Many congratulations girls, fantastic achievements.